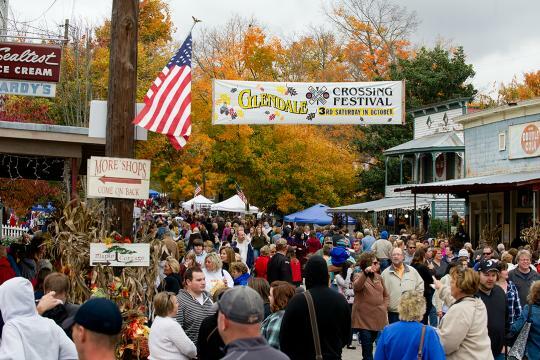 Since 1976, the Glendale Crossing Festival has been a long-standing tradition among Hardin County residents, as well as visitors from outside of the community. The event is always held on the third Saturday in October and hosts approximately 500 art, craft, and food booths. This year’s festival will take place in historic downtown Glendale on Saturday, October 17 from 8 a.m. to 5 p.m. Make sure to grab a good seat for the parade at 10 a.m. on Main Street. “Since the Elizabethtown Tourism Commission nominated the festival, we were trilled to hear the Glendale Crossing Festival was named a K.T.I.A. Top Ten Fall Event in Kentucky. Earning a spot on the list not only means the festival is still going strong, but will result in increased awareness where the list is published and promoted,” said Sherry Murphy, director of Elizabethtown Tourism and Convention Bureau. A panel of impartial judges selects the Kentucky Travel Industry Association Top Festivals & Events for each season. Criteria for selection include popularity of the event, its impact on the local tourism economy, as well as cultural and historical significance. An article listing all fall season winners will be included in the September issue of Kentucky Monthly magazine. Kentucky Travel Industry Association is a 750+ member statewide association representing all sectors of the state’s tourism and travel industry.